Several sleep aids include apps that maximize the use of the sleep device. We have reviewed the Nitetronic goodnite™ Anti-Snore pillow, which we found to be a superior pillow that inflates when it detects snoring. The pillow has two apps you can download to provide you with detailed and accurate information about your snoring habits. This post reviews the free Nitetronic Nitelink app. The Nitetronic Nitelink app was originally published by Nitetronic Hong Kong Ltd. In July 2015, and is available for various Android and Apple products. The software only takes 19MB of storage and is available in English. This software is intended to determine the effectiveness of the Nitetronic goodnite™ Anti-Snoring Pillow but can be used to record snoring with or without the Nitetronic pillow. The app records the amount of snoring during the night by activating your device’s microphone for recording. This app has received limited publicity – as of this writing there are only 14 reviews on Google Play for the Android devices and zero on iTunes. Of the Google Play reviews, the app has received a 3.5-star rating. The app’s relative obscurity, however, is not an indication of poor functionality. This app provides accurate data and does so for free. You do not need to purchase the Nitetronic pillow to download and use this app. You can use this free app with any other sleep aid to help you determine the effectiveness of the sleep aid in reducing your snoring. You can maximize the Nitelink app’s full functionality when you connect it to the Nitetronic goodnite™ Anti-Snoring pillow. It continuously records sleeping data in the background as long as your phone or tablet is connected by USB to the Nitetronic pillow. If there is an unexpected disconnect between your phone and the pillow, the app’s software will automatically resume recording once the USB connection is restored. Further, to limit the amount of tinkering you must do with the app each night, you can preschedule the start and stop time of recording by the app by connecting the device to the pillow. Recognizing that the app might drain your battery since it runs the entire night, the software allows you to turn off the app’s screen while it still records in order to conserve your battery life. Although the Nitelink app does not save and archive all nightly recordings, it does allow you to compare snoring rates across days, weeks, months, and years. The app has strong charting capabilities. The raw data the snoring software collects includes sleeping time, start time, stop time, snoring time, and snoring percentage. The app can present all your sleeping records in a one-page summary, which is a useful and easy way of interpreting the data. You can also have your sleeping data shown in list form. When the data is presented in this way, the app allows you to delete and edit entries. I found this useful when I needed to delete erroneous recordings, which in turn, helped ensure the data I was looking at was an accurate portrayal of my nighttime snoring. I used this app the first night without any sleep aids to get my benchmark snoring percentage. Without any sleep aids, my snoring benchmark percentage was 14%. This put me in what the app determines is the mild snoring range. I then used the app with the Nitetronic pillow connected to it. The app demonstrated that with the pillow, my snoring percentage dropped down to 5%. So not only was the pillow effective in reducing my snoring percentage, but also the app demonstrated exactly how effective the sleep aid was. By having the raw data available to me through the app, I could see a demonstrable change. This helped with my decision to keep using the Nitetronic pillow. Great Value for Money. Did I mention that this app is free? For what this app does, you get outstanding value. 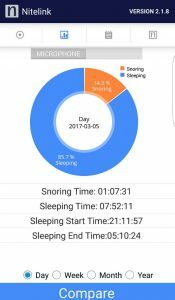 As far as accuracy of snoring percentage is concerned, the quality and effectiveness of this app are comparable to that of the premium SnoreLab app. Outstanding Charting Capabilities. I find it very useful to see and compare my sleeping data. I find it beneficial to have empirical data to show if my snoring has lessened over time. The lists and charts that are built into this software are valuable tools for helping to determine which anti snoring aids work best for your particular situation. Excellent Tool to Help Determine Effectiveness of Sleep Aids. This app is developed by the same company as the Nitetronic goodnite™ Anti-Snoring Pillow, but you do not need the pillow to use the software. So, if you are testing out another sleep aid and want to determine its effectiveness at reducing your snoring, this app is a great companion tool. Determine your benchmark snoring percentage without the device and then use the sleep aid to see if your percentage dropped. Basic User Interface. This app has a very basic user interface, with some sections of the app still containing Chinese characters. Overall though, the interface is easy to use. Device Compatibility. The app is limited as to the types of Android and Apple devices on which it can operate. If you are using the app with the Nitetronic goodnite™ Anti-Snoring pillow, Nitelink connectivity will require an Android tablet or phone support USB host to access the pillow. The software developers recommend an Android tablet if you are testing your sleeping patterns. If you are using an Android phone, the software requires a screen at least 4.7 inches in size, such as those used by the Nexus 5 or Galaxy S4/S5/S6 phone. If you want to integrate the Nitelink app with S Health, the developers recommend using a Galaxy S6 or Galaxy S6 Edge. There are no limitations posted on compatibility with Apple products. The Nitelink app is a handy app that takes minimal space on your phone but provides top service. At zero cost, this app provides accurate data on your snoring patterns and can be a great companion device as you test out either your Nitetronic goodnite™ Anti-Snoring pillow or any other pillow for snoring.